The Monuments and Memorials surrounding Washington, DC's National Mall are known the world over as symbols of America's spectacular history. This Segway tour will bring you to each major memorial and monument on the Mall in just three hours with an expert guide telling you all about them along the way! See the National Mall’s best memorials in just three hours! Have you ever tried to walk some the National Mall's best memorials? The Jefferson Memorial, the Lincoln, the Franklin Roosevelt, the Vietnam Veteran's Memorial? It can take an entire day, if not more! Our Monuments and Memorials Segway Tour makes it possible to visit them all in just three hours. As a respect to each of the sites, Segway riding is prohibited on the Memorials, so we’ll use them to venture from site to site, taking in the incredible scenery as we travel. Then, when we arrive at the site, guests can walk around the Memorials for about 15-25 minutes after receiving the great history, anecdotes, and urban legends that have made our tours famous the world over. 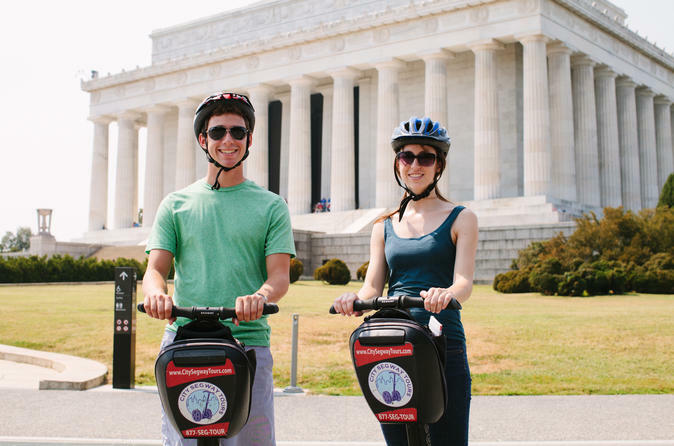 Ride with us to some of the best memorials that the Mall has to offer and experience DC on Segway! Out of respect to each site Segway riding is prohibited on the Memorials, but we’ll ride from site to site, taking in incredible scenery as we travel and hop off to walk around each memorial for about 15 minutes after arriving.